Brewing coffee may seem simple at first, but there are in fact many different methods for brewing the perfect cup. 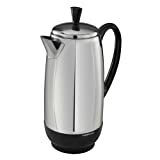 From standard electric drip coffee makers to pods, speciality espresso machines, french presses and percolators. Each has their own advantages and disadvantages, so it is up to you to find one that fits you best. 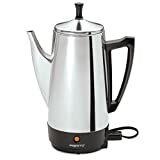 Electric coffee percolators are work by having warm water rising to the top of a pot, flowing over coarse ground coffee. There are both electric models and stovetop models, with the latter being great for durability and outdoor use. 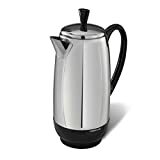 The main advantages of percolators are that they produce a very hot cup that standard drip coffee makers cannot, and that they produce a much more robust and flavorful brew. 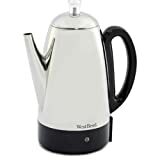 The best percolators are safe to handle, easy to operate, can brew a high capacity, have durable build, and are fast at brewing. 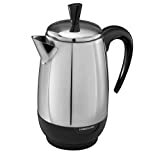 The FCP240 is an electric percolator that has a 4 cup capacity and 1000 watts of power. 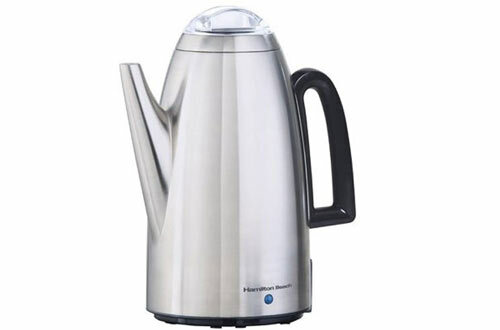 With this much power, it heats up super quick and can brew up to 1 cup per minute at a consistent speed. When it is plugged in, it will stay warm. With regards to safety, it has a cool-touch handle and rolled edge lid knob. It also has a detachable power cord for storage and safety. This machine has a great retro look and brews an even better cup of coffee. 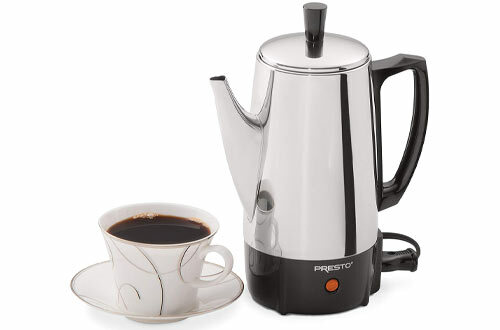 The Presto 02822 has 500 watts of power and can percolate anywhere from 2 to 6 cups of coffee at a time. It has a cool-touch handle and bottom, with a tall lid knob to ensure your safety when the machine is operating. On the bottom, there is a ready-to-serve indicator light. After brewing, it remains in an automatic keep-warm mode until you’re ready to serve and enjoy. With its detachable power cord, it is easy to store away when not in use. If you liked what you saw from the 02822 model by Presto, but desire something a little bit bigger, then the 02811 should satisfy you. It has twice as large of a capacity as the previous model, making between 2 to 12 cups of coffee. Even with larger quantities, the quality remains the same and it stays piping hot. The easy-pour spout has a traditional design and works excellently for serving. The durable stainless steel components are easy to clean, and the signal light on the base indicates when the coffee is prepared. This is a great addition to any office or business crowd looking to enhance brewing game. This model by West Bend has a large brewing capacity to price ratio. 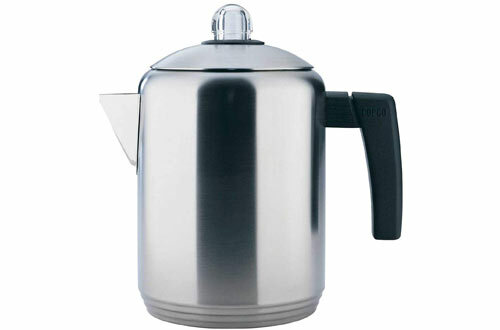 This classic stainless steel percolator can brew anywhere from 2 to 12 cups of coffee. It circulates hot water through the coarse coffee grounds, creating that rustic, nostalgic percolating sound. The durable plastic base has an indicator light that lets you know when the brew is ready, as well as a safe to touch handle. 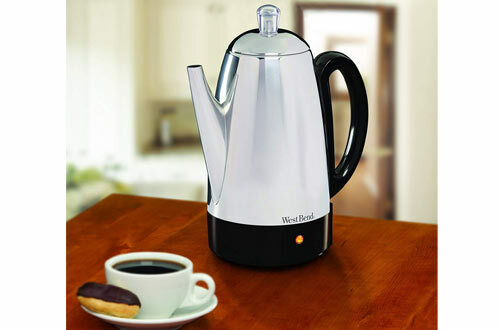 If you’re looking to entertain guests with a retro style coffee machine without breaking the bank, look no further than the West Bend 54159. 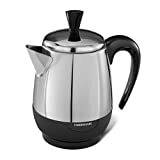 With a modern take on a classic design, the Hamilton Beach 40614 provides the benefits of an electric percolator with a few extra features. 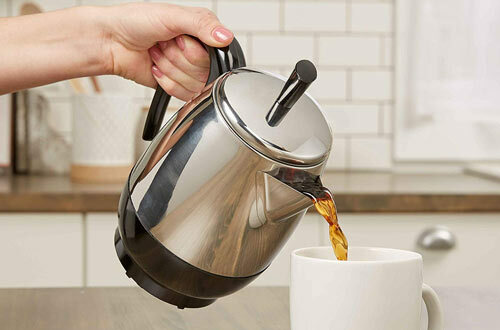 It can brew 4 to 12 cups of coffee at a time, providing a rich brew while also taking up much less space than most traditional coffee machines. It can brew at a rate of less than 1 minute per cup. The indicator light lets you know when the brew is ready, and the automatic keep warm function keeps it fresh. Two lid has a unique twist-off lock to keep from any accidental spillage. There are also measurement markings on the inside to make sure you pour the perfect amount every time. 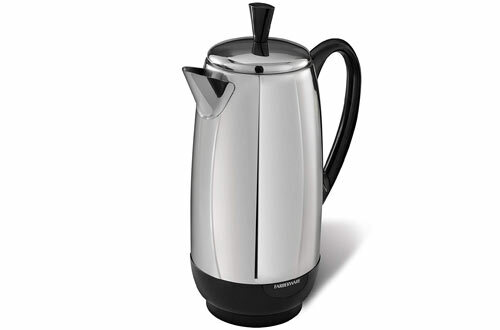 Farberware’s PK8000SS has a blazingly fast brew speed, and classic percolator design. The stainless steel components are durable and easy to clean. It can brew a max of 8 cups at a time, at a quick rate of 1 cup per minute. It has a detachable power cord for more convenient serving and storage. The auto keeps warm mode also leaves your finished brew hotter for longer. The cool-touch handle, base, and lid knob ensure a safe, and calm coffee experience. This model is relatively inexpensive for what it provides. It is recommended if you’re looking for a simple machine to make stronger, hotter coffee than traditional drip coffee makers. 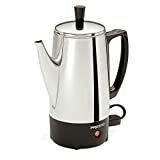 If you’re looking for something more simple/minimalist, the Medelco glass stovetop percolator should interest you. 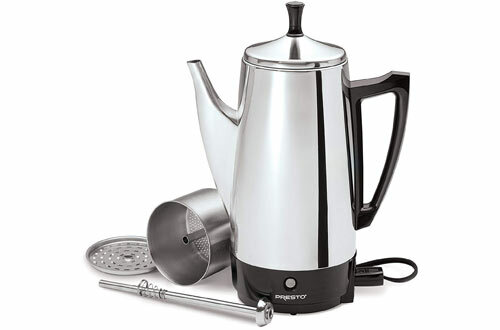 There are no electronic components on this percolator, which has a few trade-offs. While the brewing is no longer automatic, there is no reliance on electricity, which makes this great for camping. The glass is made from a high-quality, BPA-free borosilicate compound, which is thermal-shock resistant. It can make up to 8 cups, and the glass is dishwasher safe. This is a great product if you’re keen on brewing coffee outdoors and don’t have access to electricity. This is the big brother model to the Farberware PK8000SS series. It has all the great features and speed but at an increased capacity. 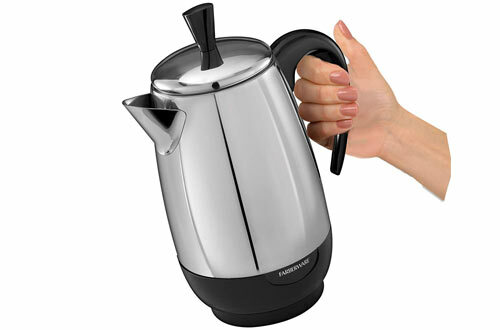 The PK1200SS series can brew up to 12 cups with the same consistent 1 cup/minute speeds. While many coffee makers tend to fail with larger models, either by diluting the taste or taking much longer than usual, this model is consistently good. If you expect to be serving bigger parties, businesses, or offices, then this will be a solid choice for its speed and capacity. This is another simple option if you’re shying away from the electric percolator models. This Copco stovetop model can brew between 4 to 6 cups of coffee. It works with any gas or electric stove, and even natural campfires outdoors. 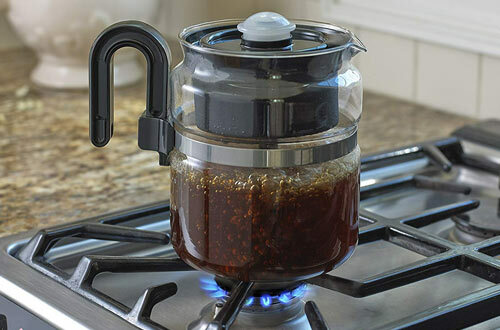 The clear BPA free lid allows you to peek into the percolating action. It has a comfortable and safe hand grip for easy pouring. It even has measurement markers along the inside to help you add the appropriate amount of water to the grind. This is another decent cheap option if you’re interested in a stovetop model. 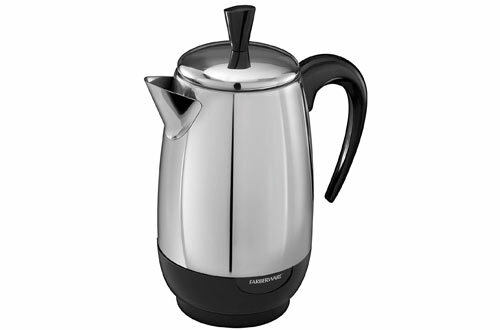 This Farberware model is similar to the FCP240, except it has a 12 cup capacity instead of a 4 cup capacity. It still contains 1000 watts of power and can brew at a consistent 1 cup per minute. 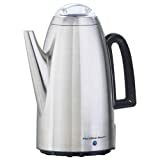 Even though it has a much larger capacity, the whole brew will still stay warm during its automatic keep warm function. It has a safe to handle design in its lid knob, base, detachable power cord and grip. This is a versatile and powerful option if you’re searching for a stronger, hotter brew.